Orson Welles’ War of the Worlds panic myth: The infamous radio broadcast did not cause a nationwide hysteria. * A Lot to Process Here! Orson Welles’ infamous 1938 radio program did not touch off nationwide hysteria. Why does the legend persist? 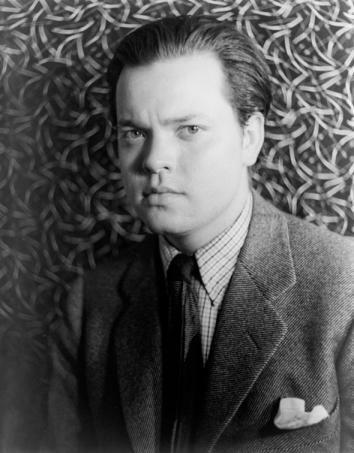 Orson Welles, photographed by Carl Van Vechten, March 1, 1937. Wednesday marks the 75th anniversary of Orson Welles’ electrifying War of the Worlds broadcast, in which the Mercury Theatre on the Air enacted a Martian invasion of Earth. “Upwards of a million people, [were] convinced, if only briefly, that the United States was being laid waste by alien invaders,” narrator Oliver Platt informs us in the new PBS documentary commemorating the program. The panic inspired by Welles made War of the Worlds perhaps the most notorious event in American broadcast history. There’s only one problem: The supposed panic was so tiny as to be practically immeasurable on the night of the broadcast. Despite repeated assertions to the contrary in the PBS and NPR programs, almost nobody was fooled by Welles’ broadcast. The contrast between how newspaper journalists experienced the supposed panic, and what they reported, could be stark. In 1954, Ben Gross, the New York Daily News’ radio editor, published a memoir in which he recalled the streets of Manhattan being deserted as his taxi sped to CBS headquarters just as War of the Worlds was ending. Yet that observation failed to stop the Daily News from splashing the panic story across this legendary cover a few hours later. New York Daily News front page from Oct. 31, 1938. From these initial newspaper items on Oct. 31, 1938, the apocryphal apocalypse only grew in the retelling. A curious (but predictable) phenomenon occurred: As the show receded in time and became more infamous, more and more people claimed to have heard it. As weeks, months, and years passed, the audience’s size swelled to such an extent that you might actually believe most of America was tuned to CBS that night. But that was hardly the case. Far fewer people heard the broadcast—and fewer still panicked—than most people believe today. How do we know? The night the program aired, the C.E. Hooper ratings service telephoned 5,000 households for its national ratings survey. “To what program are you listening?” the service asked respondents. Only 2 percent answered a radio “play” or “the Orson Welles program,” or something similar indicating CBS. None said a “news broadcast,” according to a summary published in Broadcasting. In other words, 98 percent of those surveyed were listening to something else, or nothing at all, on Oct. 30, 1938. This miniscule rating is not surprising. Welles’ program was scheduled against one of the most popular national programs at the time—ventriloquist Edgar Bergen’s Chase and Sanborn Hour, a comedy-variety show. The legend of the panic, however, grew exponentially over the following years. In 1940, an esteemed academic solidified the myth in the public mind. Relying heavily on a skewed report compiled six weeks after the broadcast by the American Institute of Public Opinion, The Invasion From Mars, by Princeton’s Hadley Cantril, estimated that about 1 million people were “frightened” by War of the Worlds. But the AIPO survey, as Cantril himself admitted, offered an audience rating “over 100 per cent higher than any other known measure of this audience.” Cantril defended his reliance on AIPO data by noting that it surveyed homes without telephones and small communities often overlooked by radio ratings agencies. But this cherry-picked data set was clearly tainted by the sensationalistic newspaper publicity following the broadcast (a possibility Cantril also admitted). 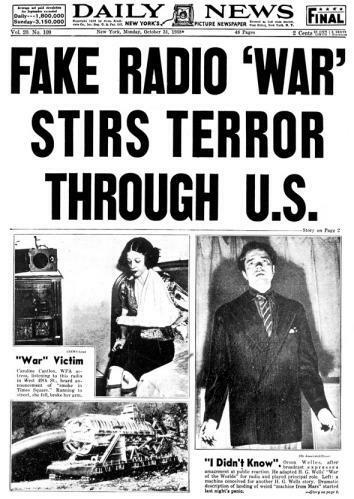 Worse, Cantril committed an obvious categorical error by conflating being “frightened,” “disturbed,” or “excited” by the program with being “panicked.” In the late 1930s, radio audiences were regularly “excited” and “frightened” by suspenseful dramas. But what supposedly set Welles’ show apart was the “panic,” and even terror, it instilled in its audience. Was the small audience that listened to War of the Worlds excited by what they heard? Certainly. But that doesn’t mean they ran into the streets fearing for the fate of humanity. And yet such behavior has become part of the War of the Worlds myth, as highlighted by the PBS program. “As Welles ran out the broadcast, the deluge of calls continued to light up switchboards across the country,” narrator Oliver Platt explains. “In some quarters there were even vague reports of suicides and panic-related deaths.” But just as the size of Welles’ audience has been exaggerated, so have reports of audience hysteria. Wire service reports did relay sensational stories of (unnamed) panicked listeners saved only by the timely intervention of friends or neighbors, but not one newspaper reported a verified suicide connected to the broadcast. Researchers in Princeton’s Office of Radio Research, working under the direction of Cantril, sought to verify a rumor that several people were treated for shock at St. Michael’s Hospital in Newark, N.J. The rumor was checked and found to be inaccurate. When the same researchers surveyed six New York City hospitals six weeks after the broadcast, “none of them had any record of any cases brought in specifically on account of the broadcast.” No specific death has ever been conclusively attributed to the drama. The Washington Post reported that one Baltimore listener died of a heart attack during the show, but unfortunately no one followed up to confirm the story or provide corroborative details. One particularly frightened listener did sue CBS for $50,000, claiming the network caused her “nervous shock.” Her lawsuit was quickly dismissed. “By the next morning … the panic broadcast was front-page news from coast to coast, with reports of traffic accidents, near riots, hordes of panicked people in the streets, all because of a radio play,” the PBS documentary recounts. But did armed citizens and National Guardsmen really assemble throughout America? Did mobs rove the streets? Not really. While newspapers made Oct. 30, 1938, a memorable night in the history of the United States, in reality it was a normal fall Sunday evening throughout North America. Four days after its initial, sensational report, the Washington Post published a letter from one reader who walked down F Street during the broadcast. He noticed “nothing approximating mass hysteria.” “In many stores radios were going, yet I observed nothing whatsoever of the absurd supposed ‘terror of the populace.’ There was none,” the reader reported. The Chicago Tribune made no mention of frightened mobs taking to the Windy City’s streets. If War of the Worlds had in fact caused the widespread terror we’ve been told it did, you’d expect CBS and Welles to have been reprimanded for their actions. But that wasn’t the case. It’s true that Federal Communications Commission chairman Frank McNinch quickly obtained informal agreement from the radio networks that fictional news “flashes” would not be used again, but no official rulings or regulations were promulgated. Nor were CBS or Welles sanctioned in any manner. (In fact, the FCC prohibited complaints about the program from being used in license renewal hearings.) For the FCC and the networks, the sensationalized newspaper reports were at worst a nuisance. Janet Jackson’s 2004 “wardrobe malfunction” remains far more significant in the history of broadcast regulation than Orson Welles’ trickery. But that one line fails to balance the accounts of hysteria peppered throughout the script. Director and Welles collaborator Peter Bogdanovich tells us that Welles “scared half the country.” The documentary further claims that “newspaper coverage about the broadcast … continued unabated for two full weeks and amounted to some 12,500 articles in total.” Yet in his comprehensive analysis of contemporaneous reporting on the panic, American University professor W. Joseph Campbell found that almost all newspapers swiftly dropped the story. “Coverage of the broadcast faded quickly from the front pages, in most cases after just a day or two,” Campbell writes, arguing that had the hysteria truly been widespread, “newspapers for days and even weeks afterward could have been expected to have published detailed reports about the dimensions and repercussions of such an extraordinary event.” Much like the broadcast itself, newspaper coverage was dramatic and sensational—but ephemeral. The PBS documentary, like so many accounts of War of the Worlds before it, can’t resist the allure of the myth. Why is this myth so alluring—why does it persist? The answer is complicated, most likely reflecting everything from the structure of our commercial broadcasting system and of our federal regulation, as well as our culture’s skepticism about the mass audience and the fear that always accompanies the excitement of new media. Even today, broadcast networks must convince advertisers that they retain commanding powers over their audiences. As such, CBS has regularly celebrated the War of the Worlds broadcast and its supposed effect on the public. In 1957, Studio One, a CBS anthology series, dramatized the panic as “The Night America Trembled,” and when the network celebrated its 75th anniversary in 2003, War of the Worlds was a noted highlight. On the other side of the coin, federal regulators must still persuade politicians that there exists an important protective role for the guardians of the airwaves. For both broadcasters and regulators, War of the Worlds provides excellent evidence to justify their claims about media power. Some portion of the blame must also go to Hadley Cantril. His scholarly book validated the popular memory of the event. He gave academic credence to the panic and attached real numbers to it. He remains the only source with academic legitimacy who claims there was a sizable panic. Without this validation, the myth likely would not be in social psychology and mass communication textbooks, as it still is today—pretty much every high schooler and liberal arts undergraduate runs across it at some point. (Both the American Experience and Radiolab segments rely on his work.) Though you may have never heard of Cantril, the War of the Worlds myth is very much his legacy. But the myth also persists because it so perfectly captures our unease with the media’s power over our lives. “The ‘panic broadcast’ may be as much a function of fantasy as fact,” writes Northwestern’s Jeffrey Sconce in Haunted Media, suggesting that the panic myth is a function of simple displacement: It’s not the Martians invading Earth that we fear, he argues; it’s ABC, CBS, and NBC invading and colonizing our consciousness that truly frightens us. To Sconce, the panic plays a “symbolic function” for American culture—we retell the story because we need a cautionary tale about the power of media. And that need has hardly abated: Just as radio was the new medium of the 1930s, opening up exciting new channels of communication, today the Internet provides us with both the promise of a dynamic communicative future and dystopian fears of a new form of mind control; lost privacy; and attacks from scary, mysterious forces. This is the fear that animates our fantasy of panicked hordes—both then and now.